By now everyone is bringing up names for who should replace Craig MacTavish as the Oilers new head coach. General Manager Steve Tambellini said Wednesday that he won't stand for an unemotional team; he wants a team that doesn't stand on it's heels and is productive. That all starts with the head coach. Unfortunately John Tortarella is already coaching or he would probably already be hired. 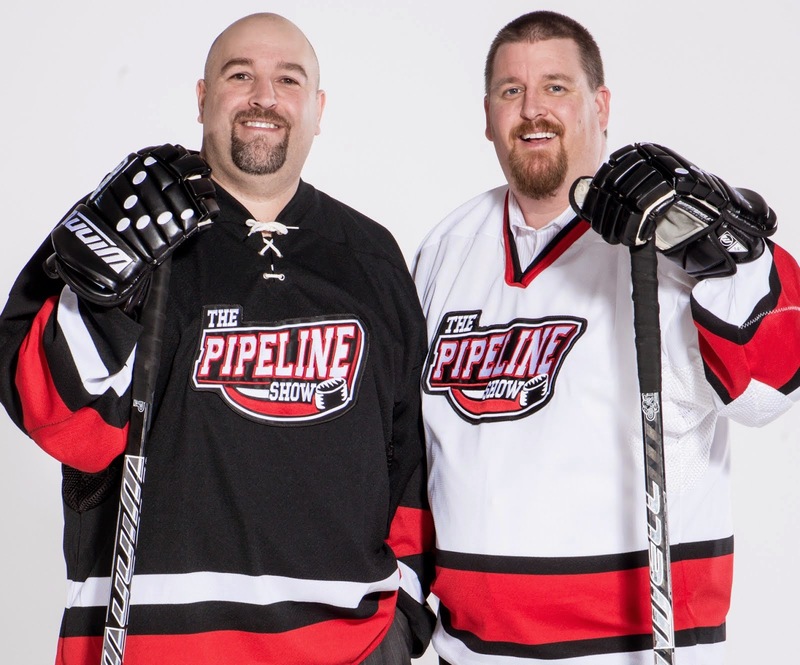 He's emotional and coaches an up tempo style on Broadway and has Stanley Cup experience. There is another guy who has those qualities, although his cup experience is as a player, that might be available but I think if Brent Sutter coaches in Alberta it will be with Calgary and not Edmonton. But there is someone who has followed the Sutter path and is my candidate for the Oilers coaching position. 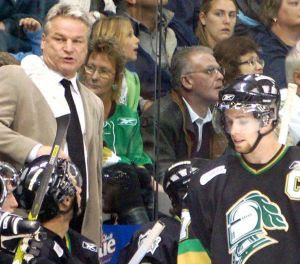 Dale Hunter has emotion, passion and aggression - just ask the 1993 version of Pierre Turgeon - Hunter racked up more than 1000 NHL points and more than 3000 penalty minutes. 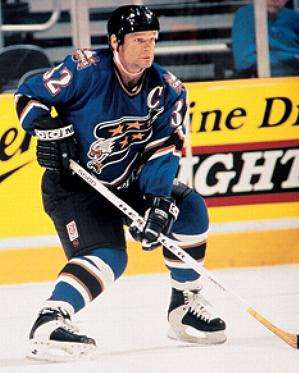 He didn't win a cup as a player but led Washington to the finals once and scored 2 series winning overtime goals. So that's Dale Hunter the player but what about Dale Hunter the coach? He's a co-owner of the London Knights and their bench boss. A team he coached to a Memorial Cup championship, on home ice in 2005, defeating a Rimouski squad led by Sidney Crosby. Now in his 8th season behind London's bench, Hunter has been to the OHL final twice, lost in the Semi-final once and has his Knights team there again this year. He's won 50 plus games 3 times while coming up a game short of the half century mark twice including this season. In 2005 the Knights broke the record for consecutive wins to start a season, held previously by the Brandon Wheat Kings at 29. London went 31 without a loss. Hunter has no problem coaching an up-tempo style. His Knights teams have racked up 300 plus goals in 4 of his 8 seasons and this year notched 287. He also doesn't mind his club playing rough with 6 seasons close to or more than 1500 penalty minutes. Hunter has coached current NHLers who should be stars of the future like Corey Perry in Anaheim, Sam Gagner in Edmonton and Chicago's Patrick Kane (even though he only had both for one season in London), Sergei Kostytsin in Montreal, Steve Mason in and Rick Nash in Columbus, Boston's Dennis Wideman, not to mention Danny Syvret whom the Oilers drafted and traded to Philadelphia where he's had a bounce back season in the AHL and could be banging on the Flyers door next year. And who knows, maybe Dale Hunter can get out of Rob Schremp what Craig MacTavish couldn't or didn't want to. Hunter has coached junior long enough that he can relate and get through to the younger generation, but he's also the type of personality that won't be intimidated by anyone, or scared to tell a veteran where he stands. There have been some points raised that Tambellini only wants a coach with NHL head coaching experience, but read below Jason Gregor's question and Tambellin's response. Does he necessarily have to have previous head coaching experience in the NHL? Not necessarily, um, he'd have to be a special person that you're confident in for someone to walk in and command the respect and have the knowledge that you felt that was ready to compete against NHL situations. But um, there's good examples of that this year, of young guys coming in that are having success and showing that they're ready. I think there's always opportunities for some people to be able to do that. To me Dale Hunter can command a room, and fits the criteria set out in Tambellini's answer. Hunter might have "it" even more than an AHL guy like Scott Arniel or an NHL assistant like Geoff Ward who I think would also make good choices if it came to them. If I win the "be the G.M. 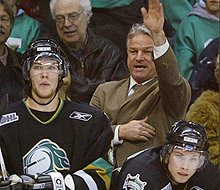 for a day" contest, the first thing I would do is hire Dale Hunter as the new Oilers head coach. No past history with the Oilers = a fresh start. One final note, my co-worker at Global TV Kevin Karius threw this at me the other day: How many NHL teams have had 3 fired coaches in the organization in one season? Chris Chihocki in Stockton, Jeff Truitt in Springfield and of course Craig MacTavish here in Edmonton. Nice job KK, even a blind squirrel finds a nut, eh... big nut? I don't think he was that cut and dry Jonathan. I have transcribed the question asked by Jason Gregor and Tambellini's response. It tells me he's open to a non NHL experienced head coach to come in. To me Dale Hunter can command a room, and fits the criteria set out in Tambellini's answer. Hunter might have "it" even more than an AHL guy like Scott Arniel or an NHL assistant like Geoff Ward who I would be happy with both choices. While Dale Hunter wouldn't be MY first choice, I have to admit that he appears more than qualified. I sincerely hope that the Oilers are going to leave no stone unturned by not limiting themselves to coaches with NHL experience. Dean: Fair enough; I watched the conference and I know Tambellini's statement was hardly absolute. On the other hand, watching the way he reacted and the subsequent statements I got the strong impression that NHL experience was going to be a requirement. That's subjective, obviously, and I may not be right, but I'd expect that Tambellini sticks to that mantra. That's not to in any way say that Hunter wouldn't do a good job, but I really don't expect to see the Oilers bring in a guy without NHL history.